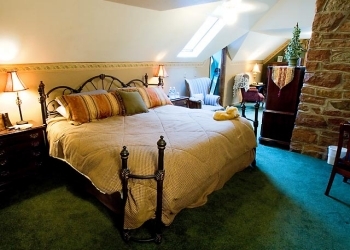 Bed and Breakfast at Historic Onaledge in Manitou Springs, Colorado is listed in the National Register of Historic Places and offers inn lodging with the warmth and charm that Manitou Springs has become known for. Within the �picturesque� mode of the late nineteenth century, the Arts & Crafts style inns Red Crags, Onaledge and Rockledge line El Paso Boulevard above the town of Manitou Springs, and collectively comprise Red Crags Estates. Red Crags Estates provides luxuriant bed & breakfast lodging for visitors to the Pikes Peak Region and offers elegant accommodations and amenities for weddings, business functions, and special events. Architect, builder and coppersmith Roland Boutwell, an Englishman, built the Craftwood Shops and the Onaledge estate in 1912. Both properties are examples of the Arts & Crafts movement, which emphasized simplicity and craftsmanship with high design standards in all architectural details. With Ruth Boutwell and Vera Richards, he incorporated the Craftwood Association, modeling it after Elbert Hubbard's shops in New York. The Boutwell's had made their start in Denver before moving to Manitou Springs. Onaledge was the original Craftwood Association residence. 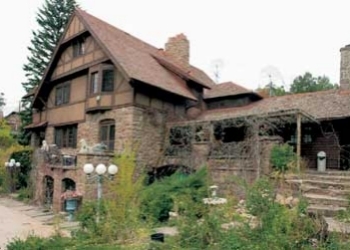 Frank Yount, oil millionaire and owner of the local Manitou greenstone quarry, later bought Onaledge for use as the Rockledge Estate guesthouse. Stone walls in front of the Craftwood Inn and Bed & Breakfast at Historic Onaledge date from their original construction. 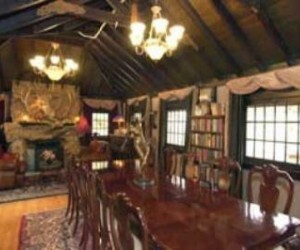 I was working as a housekeeper.One of my jobs was cleaning the Onaledge Bed and Breakfast in Manitou Springs. I was told by several Manitou Springs residents about the "Ghost of Stu," who resided at the Analedge. Stu was a happy ghost. I was skeptical of Stu's existence. That is, until one day when Stu made himself known to me in a most peculier way. He whistled a tune, but I can't recall what it was, only that it didn't scare me. It just sort of startled me and I stopped dead in my tracks. The following week when I returned to Onaledge I had my second, and what would turn out to be my last, meeting with Stu. As I was mopping the kitchen floor, all of the sudden my bucket of mop water was kicked over and the contents were spread across the floor. It didn't take me long to relaize it was Stu and I high-tailed it out of their. I jumped in my car as quickly as I could and never returned. I don't know if Stu finished mopping the kitchen or not. To this day I am believer in Stu. From what I understand, Stu died in the house in the 1930s from tuberculosis. The owners of Onaledge claim to have had several exerpiences with Stu as well. Stu appeared on their daughter's wedding photo. They also claim that Stu liked to whistle when they were in the house. I have been told that Stu is one of many ghosts in Manitou Springs. But not all of them are as carefree as Stu.